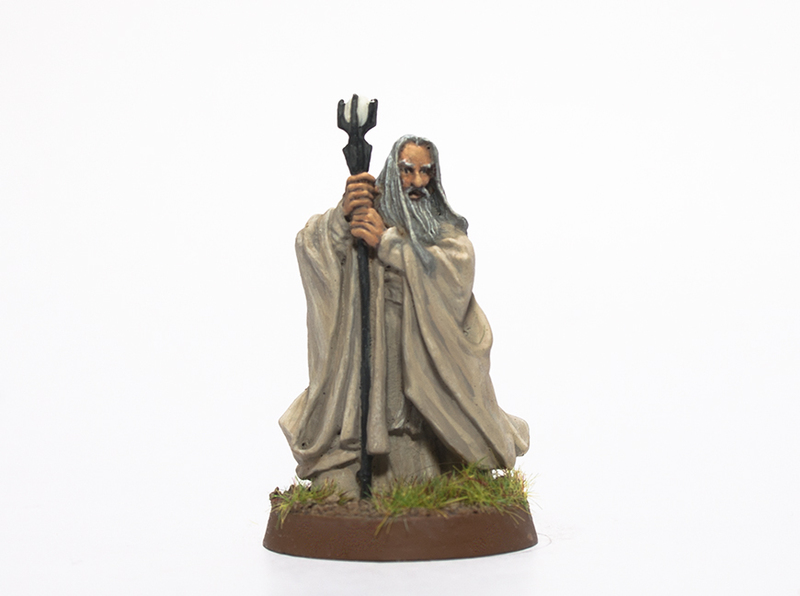 As part of my attempt of clearing my painting desk I’ve finished the 6 Saruman figures that had been sat there for a few years since I had the brainwave or painting all the Maia for The Lord of the Rings, I managed Radagast the Brown and Sauron before getting bored of the idea. It’s actually the second time I’ve painted these as the first time the varnish went cloudy which is infuriating but seems to happen to everyone at some point. 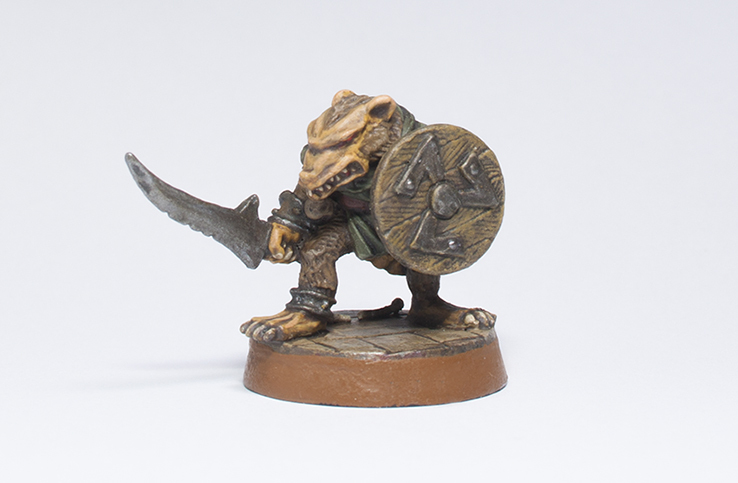 I’ve finally got finished the next batch of Dungeon Saga miniatures, some are a joy to paint others are a pita. I’ve nearly done all the monsters now, I just need to finish the Skeleton Bowmen but I don’t have the urge to paint them yet so it may be a while until the next Dungeon Saga update. 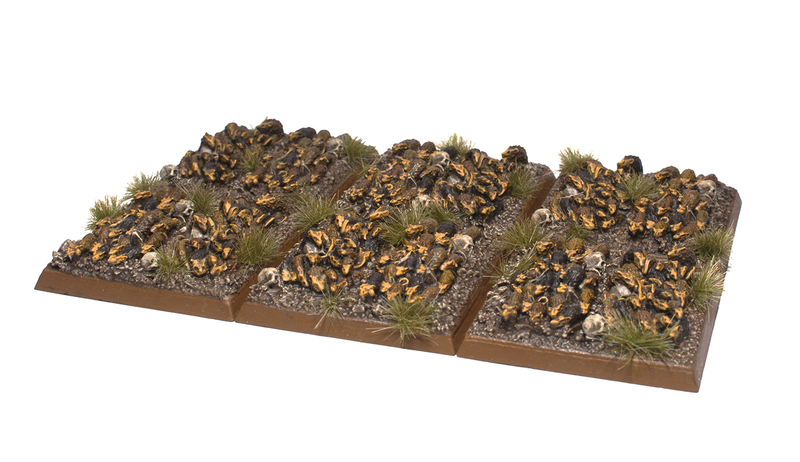 But I am currently working on a large unit of Skaven so that probably will be the next update. The Painting guide is below if needed. 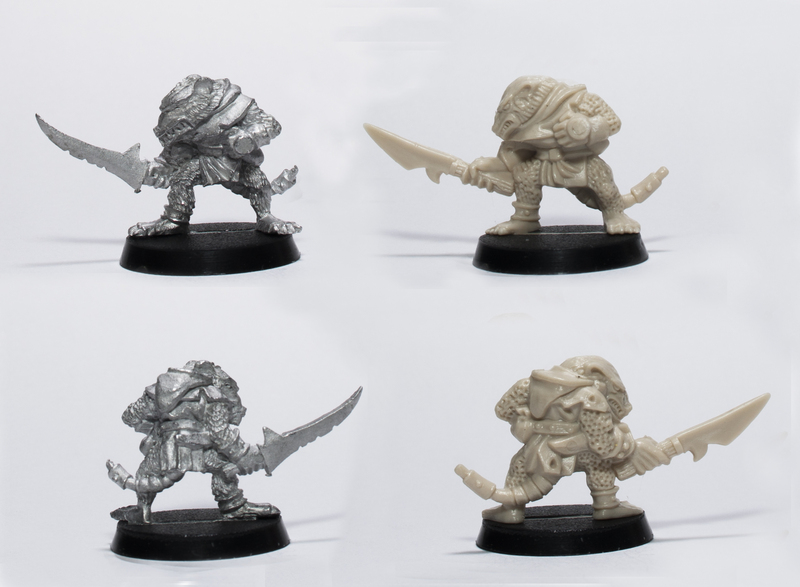 Sadly there were no rat swarm miniatures from the 80’s you were just supposed to stick the giant rats on to a 40mm base but I always found them far too large, so I’m using these as substitutes as apart from the skulls I think they fit with the older style pretty well. As you can see there are a few minor differences but they are essentially the same figure, to be honest I don’t particularly like either figure, the metal miniatures head looks a bit pig like to me, but as I’m about to start my Skaven army now I thought I’d paint the metal one up to test some colours that I’m thinking of using on them, and here is the finished result. I’m trying to get a drab look for the army with no bright colours, I’m happy with the fur but not sure about the tunics colour so I may change it for my first unit. Painting guide below if you’re interested. 1. I have to paint two models for every one that I buy this year, this is becoming essential as although I didn’t paint much last year I was still buying as normal and all my cupboards seem to be overflowing with miniatures. 2. Clear my painting desk of unfinished miniatures, this may not sound too hard to you but right now there’s probably over 100 models on it in various stages of completion, one of which has been there for 16 years now. 3. Start my Skaven army and have enough units completed for a game by the end of the year. They shouldn’t be too hard to achieve except perhaps the 2nd but we shall see. Over the Christmas holidays I picked up a copy of Dungeon Saga from Mantic Games, I was interested in how it would compare to Heroquest in both quality and it’s game play. Although I haven’t played it yet I have begun painting the miniatures and they aren’t too bad, the sculpts are more detailed than the Heroquest miniatures but they are made from a much softer plastic which has some pro’s and con’s such as they bend instead of break if dropped, most figures had warped in the box but hot water straightens them out, hopefully they will stay in the correct pose now that they are painted. The mould lines are also quite hard to remove, the plastic seems to fur up instead of being removed cleanly, I’ve heard that freezing the models first can help here though I’ve yet to try it. 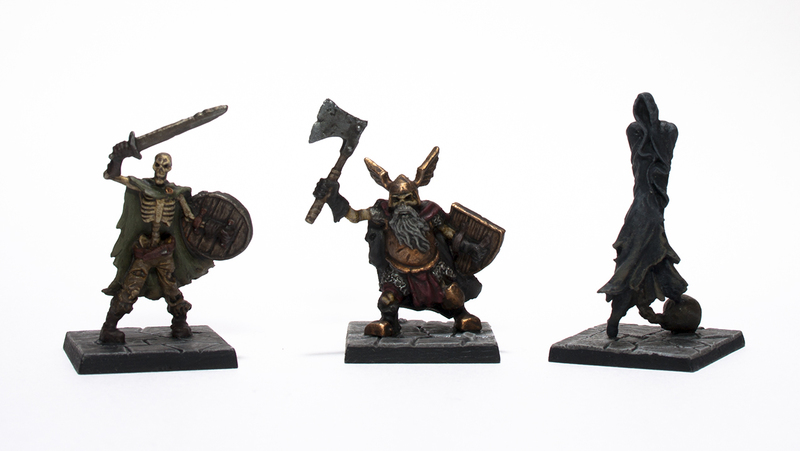 I’ve painted the first batch of undead monsters from the game, the Skeleton Swordsmen, Dwarf Revenants and Ghosts. Hopefully I’ll be able to get a fair bit of painting done over the Christmas holidays and into 2017. 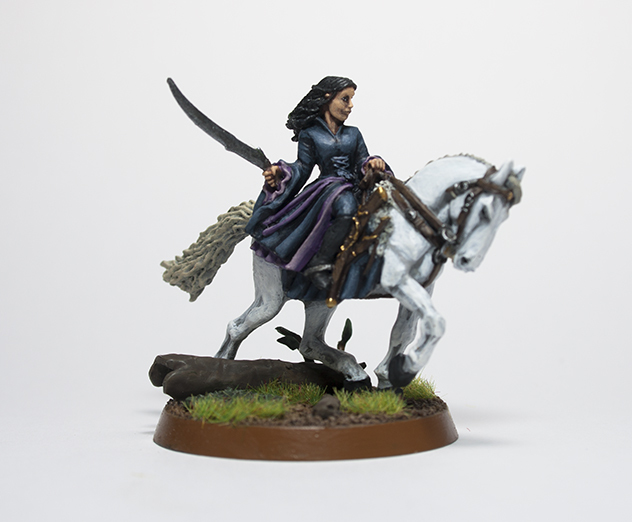 I’ve been a bit busy this month doing the boring aspects of modelling (paint stripping, flash removal, undercoating) to get much painting done but I did manage to paint the four Lord of the Rings Arwen miniatures. 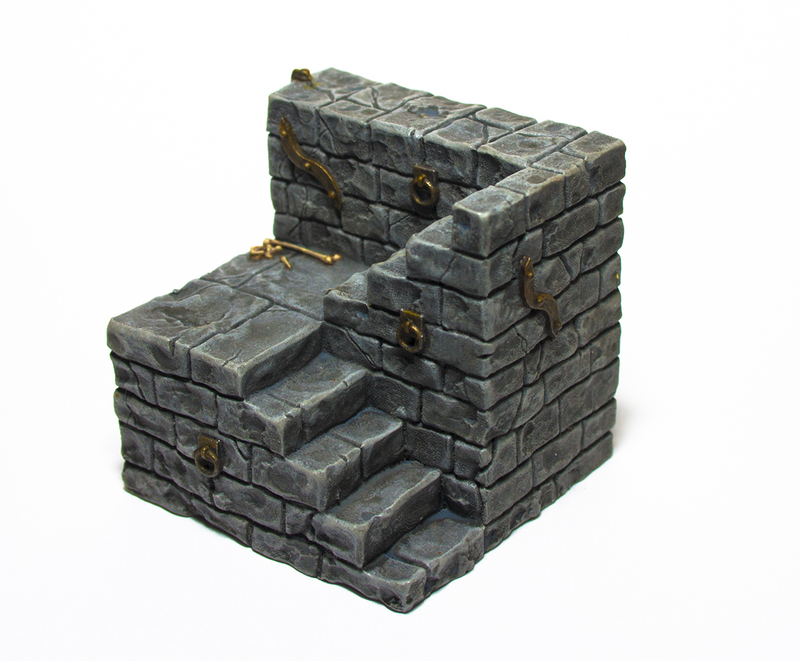 Now that I’ve finished the Heroquest miniatures I want to work on some more furniture pieces from Zealot Miniatures to use with the game, I’ve got a lot of these to work on as I intend to use them for Advanced Heroquest too. I’m always looking for new games that I can put in a cupboard for a few years until I find time to paint them, so I was pleased to find that Mantic are making a Walking Dead game on Kickstarter, it’s based on the comics rather than the TV show so the miniatures aren’t in a likeness of the actors. The game is already funded with seventeen days remaining, and with the pledge level being around £85 it’s good value as it’s worth nearly £175 at retail prices. If you are interested, there’s a video of a demo game from Beasts of War. I did manage to get him done before Christmas but I’ve been so busy I haven’t had time to update or do any more painting. This is my least favourite figure from the box, I can’t say exactly why but his style just doesn’t seem right. I can never decide if the skull is a mask or his face and the arm bands he’s wearing seem huge and rather pointless accessories, his skimpy tunic is ok but the gloves don’t really match the aesthetic . This was actually one of the first figures I painted back in the summer, he was in different colours but I wasn’t happy with the result so he got paint stripped again. I’m still not happy with him, but after looking through google images for a while I realised I don’t like any that I’ve seen so maybe it’s just the miniature I don’t like. The Skull mask or face was started with a Beasty Brown base coat then dry brushed Bonewhite followed by a Sepia Wash, I then lightly dry brushed a 50/50 mix of Bonewhite and Off White. The horns on the helmet were base coated with Charred Brown, then blended gradually lighter towards the tip with Heavy Brown, Earth and Bone White. From a Black undercoat the helmet, arm bands and belt were painted with Gunmetal mixed with 2 parts Black, it was then shaded with Black Wash and then highlighted with the Gunmetal and Black mix again, a final highlight of Gunmetal was applied to the sharpest edges. The skin was painted with a base coat of Dark Flesh, then Dwarf Flesh was added to all but the deepest recesses followed by a Fleshtone Wash. I highlighted with Dwarf Flesh again and then a mix of Dwarf Flesh and Elf Flesh, a final highlight with Elf Flesh was then used on the highest points. 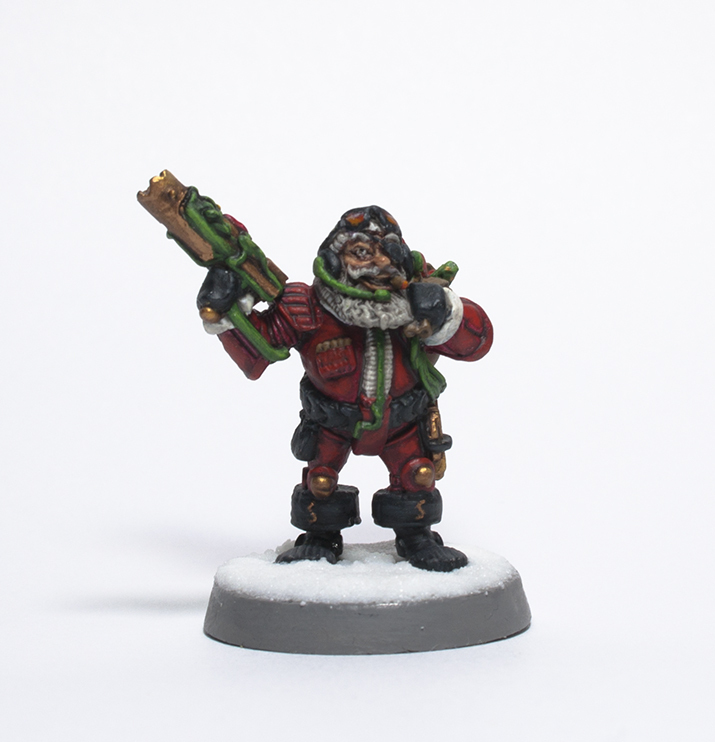 The gloves and boots and tunic were base coated Black and then highlighted with a mix of a little Cold Grey with Black, subsequent highlight were done with more Cold Grey added to the mix. The edge of the tunic and belt were then Painted with Glorious Gold and washed with Black Wash.